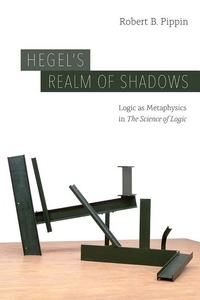 Hegel frequently claimed that the heart of his entire system was a book widely regarded as among the most difficult in the history of philosophy, The Science of Logic. This is the book that presents his metaphysics, an enterprise that he insists can only be properly understood as a "logic," or a "science of pure thinking." Since he also wrote that the proper object of any such logic is pure thinking itself, it has always been unclear in just what sense such a science could be a "metaphysics." Robert B. Pippin offers here a bold, original interpretation of Hegel's claim that only now, after Kant's critical breakthrough in philosophy, can we understand how logic can be a metaphysics. Pippin addresses Hegel's deep, constant reliance on Aristotle's conception of metaphysics, the difference between Hegel's project and modern rationalist metaphysics, and the links between the "logic as metaphysics" claim and modern developments in the philosophy of logic. Pippin goes on to explore many other facets of Hegel's thought, including the significance for a philosophical logic of the self-conscious character of thought, the dynamism of reason in Kant and Hegel, life as a logical category, and what Hegel might mean by the unity of the idea of the true and the idea of the good in the "Absolute Idea." The culmination of Pippin's work on Hegel and German idealism, no Hegel scholar or historian of philosophy will want to miss this book.